Adverbs are used to modify verbs. An adverb is a word that is used to change or qualify the meaning of a verb, adjective, other adverb, clause, sentence or any other word or phrase. However, it is mainly used to modify verbs. Adverbs are typically used to answer questions such as ‘how?’, ‘in what way?’, ‘when?’, ‘where?’, and ‘to what extent?’. How? – She was walking slowly. In what way? – She was walking barefoot. When? – She was walking yesterday. Where? – She was walking there. To what extent? – She was walking the slowest. In these examples, while the activity, i.e. the verb remains the same, (in this case, running) the adverbs keep changing. Changing the adverb modifies the verb, and gives more information, than just the verb alone. In these cases, the adverbs are slowly, barefoot, yesterday, there, and the slowest. 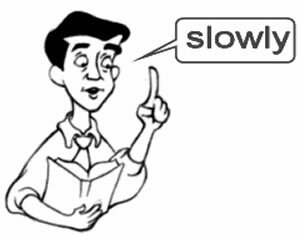 Adverb need not be a single word, in the case of the slowest. i want to improve my english skills..